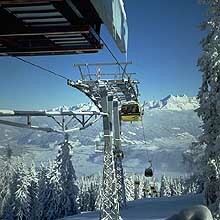 Flachau is famous for its immaculately prepared and diverse slopes. The offer ranges from simple pistes for beginners, to a variety of red runs, up to a permanent advanced section. Hi-tech lifts, with a 26,000 person uplift capacity per hr, guarantee a fast and comfortable ascent without delay. 5 storing units with a total capacity of 180,000 m3, as well as 130 snow cannons, provide 100% snow guarantee. The Flachau Cable Car company ( Flachauer Bergbahnen ) has recently invested approximately 6 Million Euros the into the development of the skiing area. The pretty village is one of several ski resorts centred around the cathedral town of St Johann im Pongau (not to be confused with St Johann in Tirol), less than an hour from Salzburg, which make up the Ski amadé region. Between them, the four valleys of St Johann, Wagrain, Flachau and Zauchensee have 320km of largely intermediate cruising, served by more than 120 lifts. They are all covered by the same lift ticket, but not all are directly linked. Flachau's chief claim to fame these days is that it is the home of Hermann Maier. His father (also Hermann) runs a ski school here and younger brother Alexander operates a snowboard school.